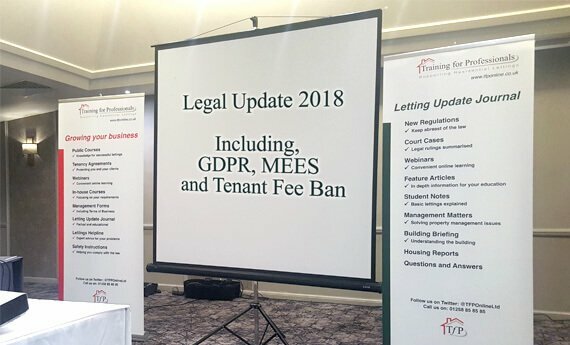 This week I was fortunate enough to have a front row seat at the Legal Update 2018 seminar which covered GDPR, MEES and the Tenant Fee ban. MEES, GDPR and tenant fees all form part of an agent and landlords responsibilities. It would be an impossible task for me to reproduce the 6 hours of valuable letting update information delivered by Training for Professionals into a single article. Therefore, I’ll do my best to summarise what I believe to be the most salient points of each subsection which may affect you – our private landlord. The new European legislative regulations GDPR come into force on May 25th, 2018 which affects any business or person collecting, storing or processing data containing personally identifiable information such as name, telephone number, email, passport, NI etc. In the interest of our clients, I sought to clarify with the Information Commission Office whether it would form part of a landlord responsibilities to be registered with the ICO as they are technically under the terminology of ‘data processor’, processing tenant data. After 37 minutes on hold, I was passed through to the registrations team who I quote “Have taken a number of calls about GDPR for landlords over the last few weeks”. They advised me that if a landlord is processing tenant data (for example: carrying out referencing, creating tenancy agreements, arranging check-ins etc) then they would be required to register. This is currently an annual fee of £35. The underlying tone I picked up from the call was that it is unlikely they will seek to impose fines of up to 20 million euros on small businesses and sole traders as highlighted in the GDPR guidelines. However, if you are processing or controlling data, you should carry out an audit and determine under what ‘lawful basis of processing’ you are handling data just to be on the safe side. The tenant fee ban was announced in the autumn budget of 2016 claiming it sought to save tenants £4.3 million in unnecessary fees. Likely prompted by the actions of a minority of agents charging extortionate admin and referencing fees. We’ve heard of some cases where agents have been charging tenants in excess of a month’s rent in areas of London. In November last year, the draft tenant fee ban bill was released which contains 27 sections and 3 schedules dealing with tenant fees, deposits and holding deposits. This proposal affects private landlords as well as letting agents. The landlord or agent may not require the tenant to pay a ‘prohibited payment’ as a condition to the granting of a new, continuation or renewal of a tenancy agreement. The most common example of a prohibited payment would be requiring the tenant to pay a referencing fee in order to be considered for the tenancy. Other such examples may include the cost of drafting inventories, check-ins or inspections. Fees that are permitted include rent, deposits, holding deposits and default fees (i.e. charging the tenant for surrendering the agreement early if consent is given by the landlord). Deposits are considered a permitted payment however; the proposal suggests that deposits should be capped to 6 weeks rent. The statutory calculation must be the annual rent divided by 52 X 6. Deposits will continue to be registered in line with deposit scheme regulations. If a landlord is to seek a holding deposit whilst the tenant undergoes referencing, the maximum amount is capped to one weeks’ rent and the same statutory calculation must be applied. Note that a new terminology has been introduced called “deadline for agreement”. This means that the landlord or agent will have 15 days to enter into an agreement and if they don’t, the holding deposit must be returned to the tenant. The caveat is that the parties can extend the 15 days if agreed in writing prior! If they do enter an agreement, the holding deposit must either be returned or used as deposit or part payment of rent. From the 1st April 2018, a landlord in England will not be able to grant a new assured shorthold tenancy (including tenancies that roll into periodic tenancies) if the property being let displays a Band F or Band G on the Energy Performance Certificate (EPC) – unless it is registered as exempt. From 1st April 2020, the above applies to all tenancies, including existing tenancies. Needless to say, that the Private Rented Sector is continuously shifting in terms of legislative updates including landlord registration requirements, selective licensing and property regulations and the responsibilities of landlords and agents are ever changing. If you are interested to learn how we can help you and your lettings and guarantee to pay your rent on time, please do get in touch with the landlord team on 0333 577 8888 and we’ll be happy to discuss our letting packages. GDPR, MEES and Tenant Fee Ban forms part of the Landlord and Agent Legal Update 2018. If you are a private landlord letting property in England, you should read this update. suitability to rent the property. This would suggest that if you ask for all information up front then reference them and they fail to have revealed something you will indeed be able to retain the holding deposit? Can I ask if there is any ability to offer financial protection for the landlords for tenants who fail referencing, as they have not been honest about their circumstances in the first place? Examples would be failing to advise about CCJs, previous rent payment defaults? I can understand why the shift is being made to landlords in some ways but this could become a costly process if prospective tenants are transparent in the first instance? Really interesting, thanks. I’ve been in my rented property for 5 years now, it’s renewal time again and I simply can’t afford the hefty renewal fee this time. 2 Questions, firstly, my letting agent also charges the landlord a renewal fee, I understood they could either charge the landlord or the tenant, not both? Secondly, they have suggested going on to a periodic contract and just pay an extra £10 a month until the renewal fee is paid for then go back on to an assured tenancy – I’m not happy about this, what are your views? As far as I am aware, the landlord is happy for me to sign up for another 12 months. Hi Jonathan. Is it legal for a landlord to ask for agreement fee for renewal of agreement. I paid this before renting. I’m I required to still pay this since its just for renewal and nothing really is changing on the agreement apart from the dates? Thanks. Hi Cap Gel, it is not currently “illegal” for a landlord to request a tenancy renewal fee – it will be when the tenant fee ban comes into effect next year. Nice Article! Thanks for your article that very helpful to people. By your advice, we choose the best private landlords. Your article is very unique, informative, interesting thanks you for sharing it. You’re welcome – thanks for the feedback. So it is now 10 days until the MEES are due to be fully implemented, but the registration portal is not working and they are trying to get it up and running for the 1st April! So what happens now? What if it is still not working on the due date? Can’t see how this is going to work? Can I rent a flat out on 1st April with EPC F although it will be on the exemption? I have a question regarding the holding fee.. If the tenant fails referencing, can the landlord retain the holding fee as compensation for lost rent and a failed referencing cycle? Michelle, if the landlord and tenant have agreed that the holding fee was non-refundable and the conditions of which were stipulated i.e. failed references, then the landlord can withhold the fee. HOWEVER – this will not be the case when the Tenant Fee ban comes into action. Do we know yet when the new rules regarding tenant fees will come in to effect? As the bill is in draft stage it can still be amended however, it is likely to be around April 2019. Could you tell me please if a landlord can withdraw a tenancy after he or his agent has signed the agreement and ask the tenants to leave with no reason. Hi Lynn, thanks for the question. In short, assuming you have an assured shorthold agreement, if both parties have signed the agreement and money has been paid, then both parties are bound the the agreement.